Before placing object data into SwiftStack, users create a container which holds the listing of all objects stored under the container's namespace. Objects placed into the container's namespace will be stored according to the object data storage policy assigned to that container. Each storage policy will have its own ring, and each ring will define which drives can be used to place objects stored in the Storage Policy. All data stored under a container/bucket namespace will be placed according the configuration of the storage policy which was set when the container was created. Storage policies may also be used in conjunction with SwiftStack Cloud Sync. Private SwiftStack clusters may be used in addition to public cloud (such as AWS or Google) storage. 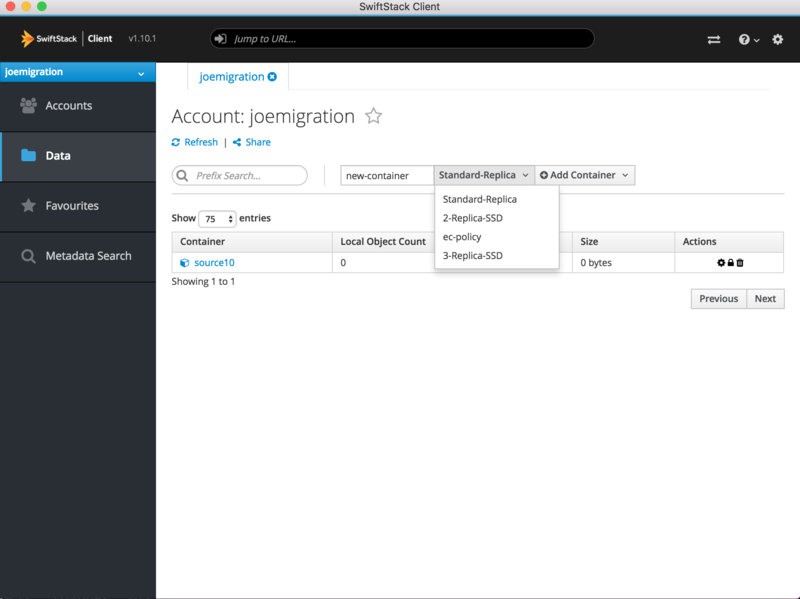 SwiftStack Cloud Sync can be configured to create a single namespace between private SwiftStack Clusters. Profiles may also be configured to lifecycle or mirror data between SwiftStack Clusters clusters. The storage policy configuration options of SwiftStack allow a great deal of flexibility in how object data is stored in the cluster. Different options work better for different use-cases. When using storage policies, a single SwiftStack cluster can offer multiple object data storage options at the same time to best serve multiple targeted use cases. Large variety of files and access patterns. Availability and simplicity is most important. Disk space for storage is at a premium. Higher read latency on small (<4MB) files are considered a reasonable trade-off. Data is created and accessed in multiple data center regions, a failure at one site should not disrupt access to storage in another. Each site is fully durable, but will leverage remote site for necessary fragments when necessary. Data is only created and accessed from a single site. Access to data from another region should be rare with an expectation of higher latency or reduced availability due to network interruption. Once a policy has been pushed to the cluster, it cannot be deleted, only deprecated. Once a container has been created with a policy, its policy may not be changed. Only one policy can be default. The "Standard-Replica" policy, or whatever other policy has been marked as Default will be the storage policy applied to any container which has not had x-storage-policy set. Any object policy can be designated the default. 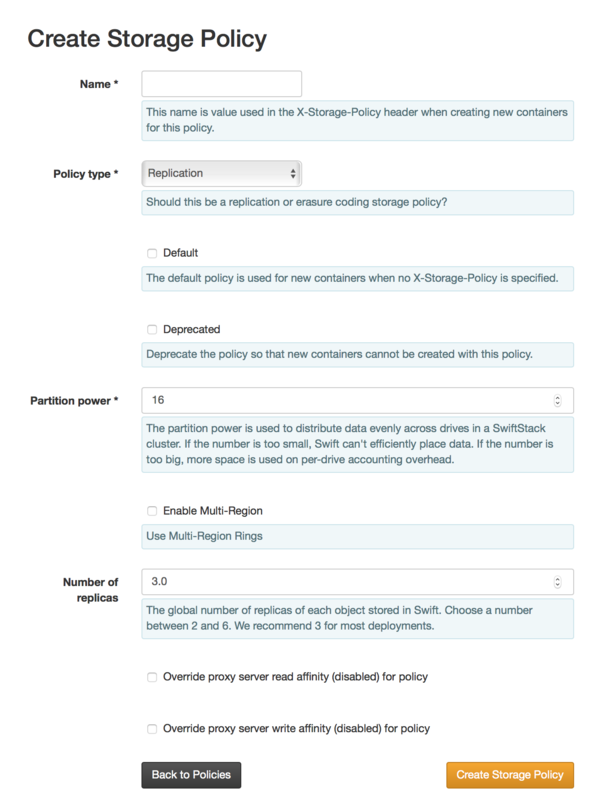 If you edit the Default Policy on the Storage Policy List page, click the Submit button to save changes. Deleting a policy could leave data orphaned on the cluster, so it is not permitted. If continued use of a policy is no longer desired, mark the policy as Deprecated. Existing containers using these policies will still be accessible, but it will not be possible to create new containers using this storage policy. If you edit a policy's Deprecated status on the Storage Policy List page, click the Submit button to save changes. This policy is used to define on which drives the account and container database will live. Since Account and Container data is relatively light-weight, yet accessed frequently, this policy should be applied to smaller, faster drives. 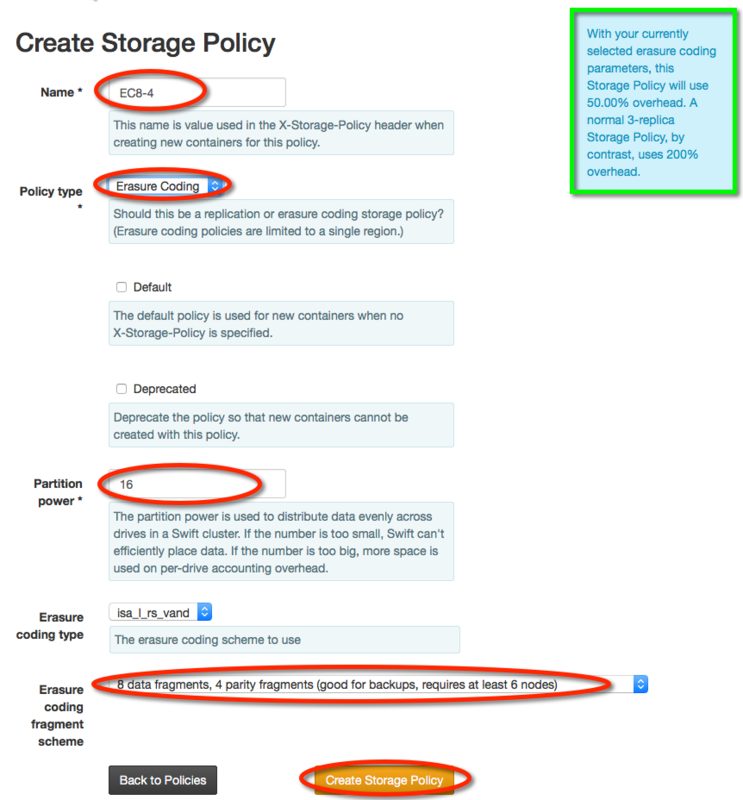 On the cluster's Policies tab, click the Create Storage Policy button. Mark the policy Default or Deprecated as desired. Specify the Part Power (10-22). This number is used to determine how much data to move at one time while rebalancing the ring. Use smaller numbers for smaller rings and larger numbers for larger rings. Choose the Policy Type, Replication or Erasure Coding. Specify the number of replicas (2-6). If it is desired to place data across multiple data center regions, create a storage policy with the desired number of total replicas to be distributed across all data center regions. Use this storage policy when assigning storage devices for all desired regions for this policy. This is useful to optimize capacity utilization if specific region data placement is not required. To specify the number of replicas desired in each region, select Enable Multi-Region checkbox. This will then enable the selection of how many replicas are desired in each region for this policy. Select the desired Erasure coding fragment scheme. A box in the top right corner will calculate space savings compared to the Standard-Replica policy. Click the Create Storage Policy button to save. You can now add drives to your new policy. See Add Policies to the drive(s) for more information. There is a cluster-wide setting for storage region read and write affinity. For more information on read and write affinity see Region Affinity. However, it is possible to configure a SwiftStack cluster with read and write affinity settings for individual storage policies. This can be done using the Edit button on the cluster's Policies tab. The cluster server read affinity and write affinity settings may be individually overridden per storage policy. Regions and zones are defined failure domains within your SwiftStack cluster. Zones are intended to be used as points of failure zones. For example, if you have a rack and all the nodes in that rack all rely on the same top-of-rack switch, that could be treated as a zone, while a second cabinet, with its own top-of-rack switch, could be another zone. Similarly, if your installation is relying on UPSes, a zone schema could be applied based on nodes connected to a certain UPS or set of UPSes. Regions have a special designation that may be used by read/write affinity rules, data replication rules to limit WAN bandwidth and enable various storage policies such as deterministic replica placement across regions and multi-region erasure code policies. While operators define their Zones and Regions, the data placement algorithm used by a SwiftStack cluster will distribute data "as-uniquely-as-possible" across individual drives, storage nodes, data center zones and data center regions. In the event of a natural disaster at the primary data center, at least one replica of all objects has also been stored at an off-site data center. Data stored to a data center on one side of the country is replicated to a data center on the other side of the country in order to provide faster access to clients in both locations. VPN Connectivity - a standalone VPN controller through an Internet connection. Both methods require that the routing information, via static routes or a learned routing protocol, be configured on the storage and proxy nodes to support data transfer between regions. Amount of cross-region replication that will be taking place; too small of a circuit will result in bottlenecks for replication traffic. Expected number of operations per second. Depending on the setup, proxies generally need to successfully write one or more copies of the object across the region before returning a success. Because the connection is already high latency, these writes will take longer than if contained in a single region. Bandwidth must be sized to support the expected number of operations per second otherwise increased latency may be experienced by an end user of the system. Cost. A private circuit will increase in cost based on the distance between regions. Region and Zone configuration is available on the Regions tab of the Manage Cluster page. SwiftStack automatically creates a Default Region with one zone for each cluster. If your cluster only has one region, nothing needs to be changed on this page. Regions may be added by providing a name and clicking the Add button. A region's name may be edited by clicking on the pencil icon next to the name, modifying the name, and pressing enter . A region cannot be deleted if it contains a zone. Click Delete to delete the region. Add Zones to each region to define single points of failure like power and network distribution facilities. Zones often have a 1:1 relationship with racks or data center rooms. A zone's name my be edited by clicking on the pencil icon next to the name, modifying the name, and pressing enter . A zone cannot be deleted if it contains a node. Click Delete to delete the zone. When using multiple regions with SwiftStack, both write-affinity (store objects to local nodes first) and read-affinity (read objects preferentially from local nodes) are available. When handling a data PUT (write) request, a proxy server will normally attempt to write the object data to all of the object's primary storage locations, as described in Swift Overview—Data Placement. In a multi-region cluster this will require some object data being written to another geographic region, potentially causing extra latency before the PUT request completes. The write affinity setting causes the proxy to initially write object data only to locations in its local region. Data that would normally be written to a remote region is instead written to a temporary location in the local region, which can speed up the completion of PUT (write) requests. This object data is then asynchronously moved to its final location in a remote region background processes. With write affinity enabled, data is temporarily stored in fewer failure domains. The write affinity setting results in increased workload for background processes. It is recommended that write affinity is only enabled when there will be periods of time with few PUT requests, so that asynchronous background processes are able to keep up with the movement of object data to remote regions. 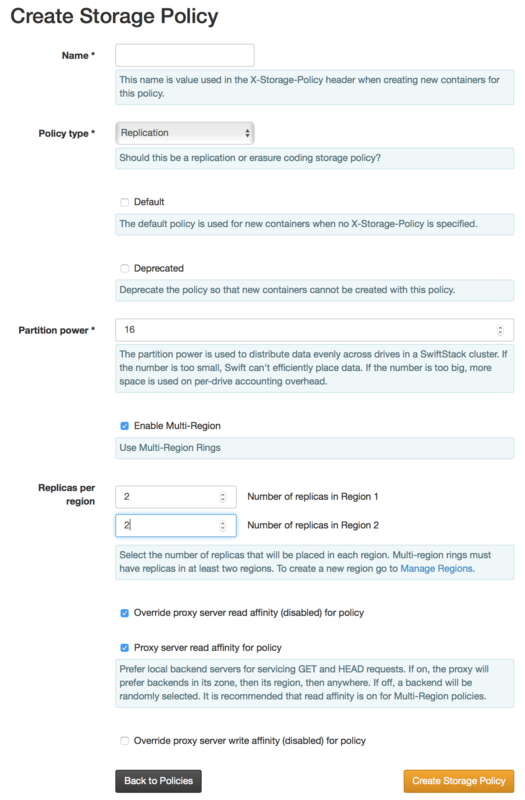 This setting may also be changed for individual policies, see Storage Policies Configuration Options. When GET (read) requests come into a proxy server, it attempts to connect to a random storage node where the data resides. When configuring a multi-region SwiftStack cluster, some of that data will live in another geographic region, with a higher latency link between the proxy server and the storage node. SwiftStack allows for you to set read affinity for your proxy servers. When enabled, the proxy server will attempt to connect to nodes located within the same region as itself for data reads. If the data is not found locally, the proxy server will continue to the remote region. From the cluster's Tune page, you can enable read affinity for your proxy servers to prefer reading data out of the local region first before trying remote regions.